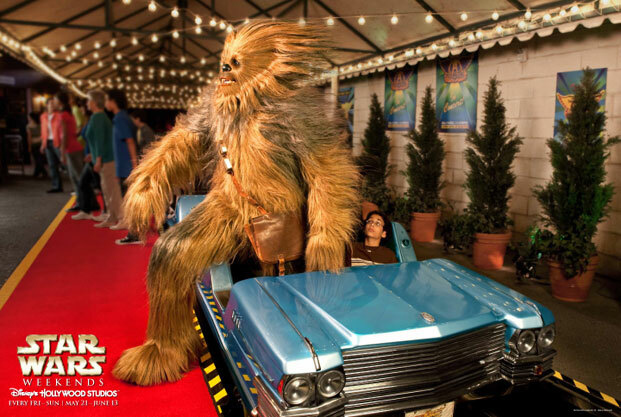 Star Wars Weekends will be returning to Disney's Hollywood Studios on May 21st for the first of four weekends of this action packed event. 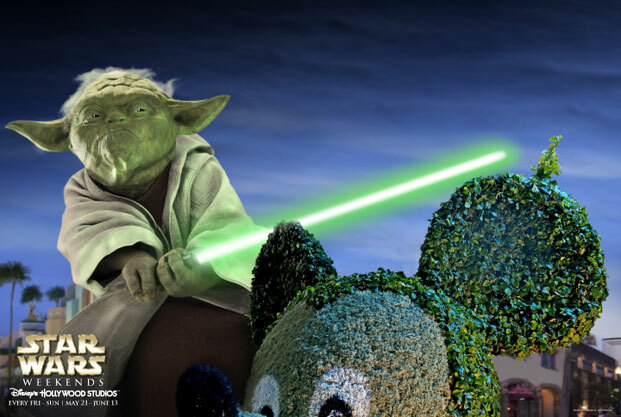 To promote Star Wars Weekends, Disney World has created 6 promotional posters that will be on display throughout the Orlando Area to promote the Disney Parks annual tribute to Star Wars. You can find these posters on display everywhere from the Orlando International Airport to billboards. When the posters go up each year you know it is time for the Star Wars characters to make their appearance at Disney's Hollywood Studios. 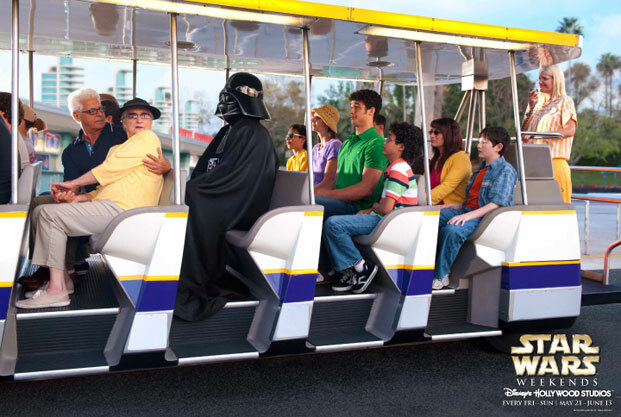 The posters (which can be found on http://www.starwars.com/ ) show the lighter side of the Star Wars Weekends and the creative designs are something to look forward to each year. The first poster shows Chewbacca getting out after riding the Rock 'n Roller Coaster and his fur is quite windblown. 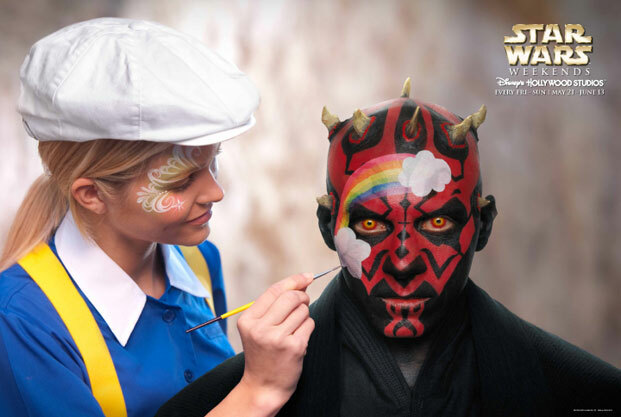 The second poster shows the softer side of Darth Maul as he stops to visit one of Disney World's Face Painters and has a rainbow added to his face. The third poster shows Darth Vader riding the tram during the Backlot Studio Tour. No one was daring enough to sit with him. I guess he is destined to be a loner. Poster number 4 depicts the challenges of parking your AT-AT Walker at Disney's Hollywood Studios parking lot. In case you were interested AT-AT stands for All Terain Armored Transport. 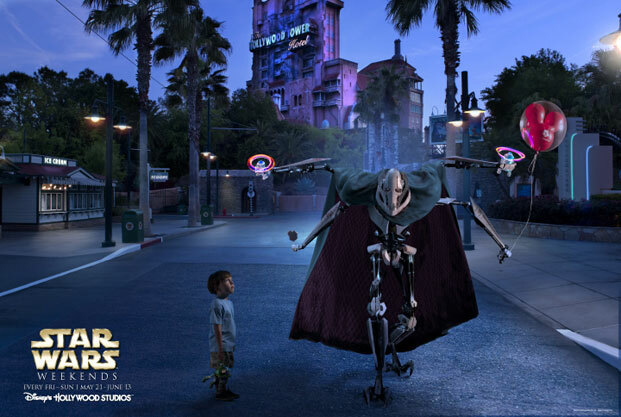 In the 5th poster General Grievous has collected his soveniers from a day at the Disney Parks. In the 6th and last poster Yoda shows that lightsabers can be the perfect tool for trimming the Mickey Mouse topiaries that you find at Disney World. 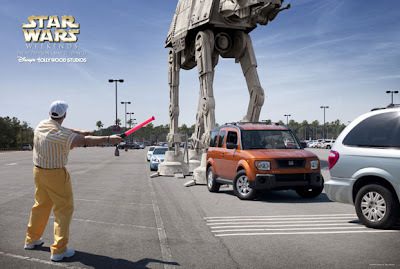 0 comments to "2010 Star Wars Weekends - Advertising Posters"